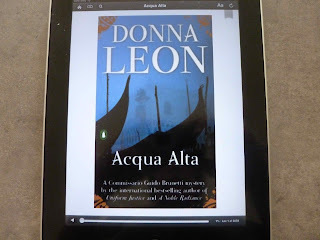 The Little House of Concrete Bookshelves: Donna Leon "Acqua Alta"
A North Queensland wet season with the regular river rises and frequent flooding is probably a good time to read something set in the middle of the Venetian acqua alta (high water). One of Leon’s strengths is the way Venice is portrayed through Venetian eyes, and the portrait isn’t always painted at the most attractive time of the year. Acqua alta refers to exceptional winter tide peaks in the Venetian Lagoon and the northern Adriatic. There’s partial flooding in Venice as the tides are reinforced by seasonal winds, the southerly sirocco and the north-easterly bora, which blows across the Venetian lagoon. The two combine to hamper the usual outflow resulting from winter rains, which is also affected by the long rectangular shape of the Adriatic (there’s an oscillating water motion, the seiche, that supplements the regular tidal cycle to produce more extreme tidal events than you’d find in the rest of the Mediterranean basin), the shape of the Venetian lagoon, soil subsidence in Venice and the coastal areas around the Lagoon and rising sea levels. When all these factors coincide they prevent one high tide from ebbing, which means the next high comes over the top of it in a sort of self-perpetuating cycle and it’s time to sound the sirens and alert the citizens of an intense event (80 to 109 cm above regular sea level, affecting up to 14% of the city), a very intense episode (110 to 139 cm, up to 54%) or exceptional high waters (above 140 cm). If it gets to two metres the whole city will go under. The flooding isn’t uniform due to differing heights above sea level throughout the city, distances from channel and canals, the height of the footpaths (fondamenta), and the layout of the sewerage and drainage network. In such circumstances no sensible person will leave home without their gumboots and the routes they take to and from work, shopping and whatever leisure activities they’re inclined to indulge in aren’t necessarily the shortest line connecting two locations. Police work and civil rescues are affected by the waters, and the ways in which the locals deal with the day to day issues adds colour to the series, and fleshes out a rather straightforward plot line. 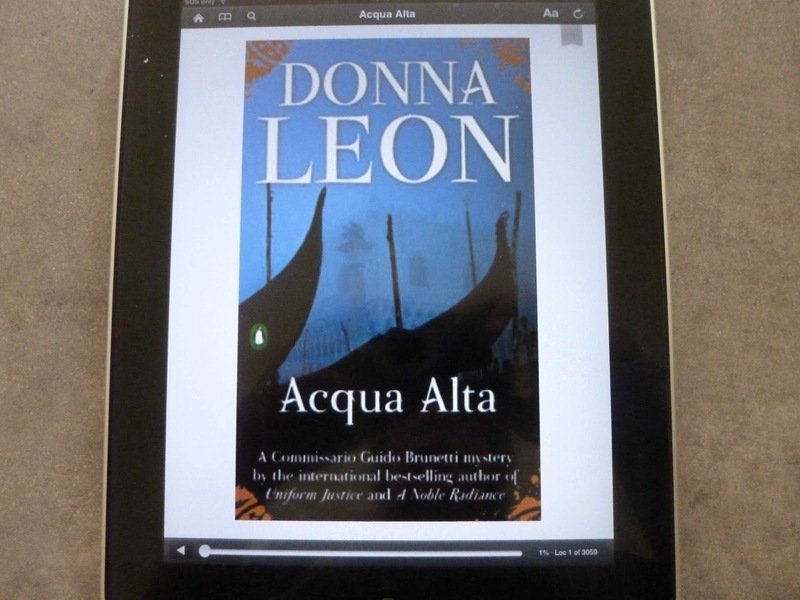 As far as that plot line is concerned, Acqua Alta reintroduces us to American art historian and archaeologist Brett Lynch and her lover, operatic diva Flavia Petrelli from Death at La Fenice, the first book in the series. Brett, who organised an exhibition of Chinese pottery, is savagely beaten by two well-dressed men, who warn her not to keep an appointment with Dottor Semenzato, director of the museum where the exhibition was displayed. Brunetti is one of the few who are appalled by the attack, since he knows Brett and Flavia from the earlier episode, and he’s determined to track down the culprit. Vice-Questore Patta isn’t that concerned by an assault on a foreigner who happens to be a lesbian, but when museum director Semenzato is murdered there’s a bit more urgency in the investigation (as far as he’s concerned, anyway). There’s more than likely some connection between the two cases, and even if it turns out there isn’t, that assumption is the obvious place to start. As Brunetti continues the investigation it becomes clear that the exhibition of Chinese antiquities is a key piece in the jigsaw puzzle. It seems Semenzato had been peddling artworks, including some lifted from the Chinese exhibition and replaced with close replications, and his customers include some influential people, including a Sicilian who simultaneously is and isn’t the stereotypical Mafia boss. By the fifth title in a series that runs to more than twenty and counting, the themes that underlie a Brunetti mystery are firmly in place and the long term reader knows, more or less, what the story’s going to be about. In those circumstances the local colour, the acqua alta, the intricacies of the heating system in the Questura and the interactions between and among the regular characters are what keeps the reader coming back for more, assuming the Brunetti stories are the kind of thing that floats your boat. Marco Vichi "Death and the Olive Grove"
Andrea Camilleri "The Dance of the Seagull"
Gregg Allman "My Cross to Bear"